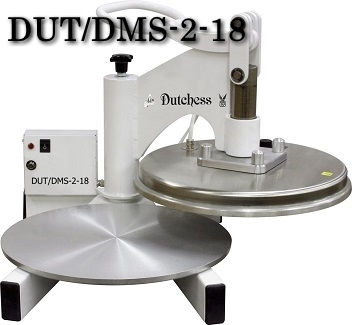 DUT/DMS-2-18 MANUAL PIZZA & TORTILLA DOUGH PRESS -- Dutchess Bakers Machinery Co. Inc. The Model DUT/DMS-2-18 manual Dough Press is the most efficient, durable and easy machine to press Pizza or Tortilla dough. With the large 18” heated platens you can press pizza skins or tortillas in seconds. Pizza dough can be cold or warm pressed depending on your specific needs. The lightweight top platen easily swings to the side to allow quick loading and unloading of product. Large 18” Round aluminum Platens. Full range thickness from paper thin to 7/8”. Heated upper and lower platens Off to 450°F, 232°C or use it without heat for cold pressing. Top platen swings swings to the side for easy	dough removal. Heat indicating light turns off when set temperature is reached. Optional non-stick Xylan coated platens. 240v/60hz/1ph, 3100 watts, 14.5 amps. Par-bake Tortillas or Pizza dough. Warm or cold press Pizza dough. 1000 or more Tortillas per hour.